Mastodon and Coheed And Cambria will head out on the road together across North America later this year on The Unheavenly Skye Tour. The run of 26 shows will get under way at the Iroquois Amphitheater in Louisville on May 28 and wrap up at The Pavilion At Toyota Music Factory in Irving on July 3. Every Time I Die will be special guests for the run, while Mastodon will be performing their 2009 album Crack The Skye in full to celebrate its 10th anniversary. Coheed And Cambria, meanwhile, will be touring in support of their latest record The Unheavenly Creatures, which was released last year. Tickets for the tour will go on sale this coming Friday (February 15) from 10am local time. 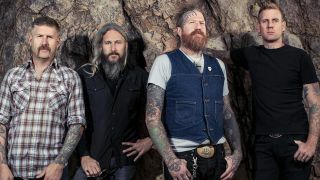 Mastodon are currently on tour across Europe and checked in back in December to confirm that they’ve started work on new material.